Scribbles In the Sand........... My Desert Diary: Happy Birthday Mike!! As you may have guessed from the not so cryptic title of this post... It was Mike Birthday last week. So, of course I made him this 200 pound Cthulu cake! Ok.... No, I didn't. 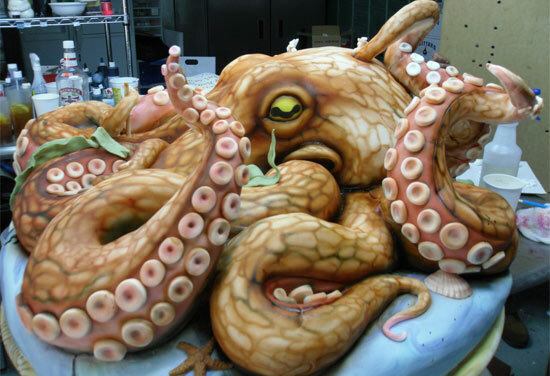 Someone else made this alarmingly realistic octopus cake, but it really is 200 pounds! I made a carrot cake that looks lame in comparison to this awesome creation. It was about 1 pound...maybe. We had a great time though milling around the Artwalk By the Bay. I forgot the camera so you'll just have to trust me. The good news is that another issue of "The People That Melt in The Rain" the webcomic was released this week. It's a free download if you go to this site!